The DFG (Deutsche Forschungsgemeinschaft) has approved the funding of my research project on interactive optimization. The project will be conducted at the Institute of Computer Science of the University of Osnabrück for a period of two years. This project involves several collaborators in different countries: Dr. David Meignan (Principal investigator, University of Osnabrück, Germany), Pr. Sigrid Knust, Pr. Joachim Hertzberg, and Dipl.-Systemwiss. Florian Bruns (University of Osnabrück, Germany), Dr. Jean-Marc Frayret, and Pr. Gilles Pesant (Polytechnique Montréal, Canada), Pr. Abderrafiâa Koukam, and Pr. Vincent Hilaire (University of Technology of Belfort-Montbéliard, France). The project funded by the DFG is the continuation of an initial study conducted since April 2012 by Dr. David Meignan and Pr. Sigrid Knust. This work on interactive optimization has been awarded by a grant from Google within the “Google Focused Grant Program on Mathematical Optimization and Combinatorial Optimization” in 2012. Interactive optimization is the combination of combinatorial optimization methods with expertize of a human operator or user. Over the years, Operation Research has produced numbers of successful computational approaches and software tools for solving hard combinatorial optimization problems of practical significance. However, in several application domains there is still a large gap between research and application of advanced optimization methods, in particular for decision support tools. Interactive optimization is an active and promising paradigm to fill this gap between research and application. The objectives of this project entitled “Interactive metaheuristics for optimization-based decision support systems” is to develop efficient and practical models, algorithms and software tools for the design of interactive optimisation methods for decision support systems. Two optimization problems have been identified for evaluating the proposed approach. The first one is a staff scheduling problem, whose objective is to determine satisfactory schedules for employees according to workload, legal constraints and staff preferences. The second optimization problem concerns the planning of operation in intermodal transportation. The project description is also available in the GEPRIS database in English as well as in German. Few years ago, a new type of social network appears on the web, “Social networks for researchers/scientists”. For Instance, ResearchGate, Academia and BiomedExperts are originally designed as social portals. Other websites such as Mendeley have progressively introduced social services in their platforms. Utility of these websites have been questioned in diverse blog-posts, Forbes, Blogs.Nature, Presans, MyScienceWork to cite a few. Personally, I don’t consider that the means of communication provided by these platforms are very useful. I spent very little time on these “social networks”, and prefer to explore collaborative tools for smaller networks (colleagues, collaborators, university, and communities on my research topics). I illustrate this point with two examples of websites that were recommended to me by colleagues. Note that I do not criticize these platforms for researchers (they present some interesting innovations), but I point out some important aspects for appropriately using them. These aspects of content rights have to be carefully considered for publishing some research results on websites. Second, the majority of these platforms restricts or blocks the access of content to non-registered user. These restrictions apply on your list of publications, abstracts, posts or full-texts. 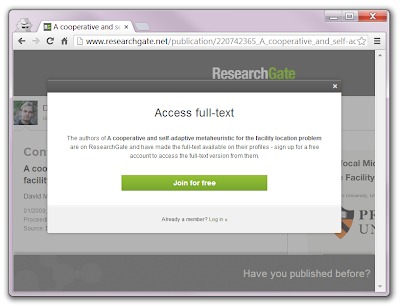 For instance, below is a notification for the access of full-texts on ResearchGate. Clearly, the majority of these “social networks” for researchers are not Libre or open-access platforms, they just monetize research material. Again, researchers have to consider these aspects when they provide content and spend time on these websites. More important, researchers and research institutions must ensure that their data-handling/publication/copyright policies are in accordance with these websites. It is high time for researchers to consider content rights for their research results, and for Universities and funding institutions to provide clear guidelines on research communications and data-handling.